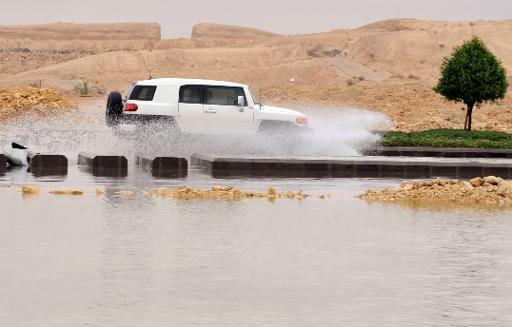 Flash floods sparked by torrential rain in largely desert Saudi Arabia have killed four people and left 10 missing over the past two days, the civil defence authority said Tuesday. Two of the dead and seven of the missing were in the capital Riyadh, with the rest coming in the northeastern city of Arar, the authority said in a statement carried by the official SPA news agency. Since Monday, emergency teams have rescued 1,357 people trapped by the floodwaters, it added. It urged the more than five million residents of the capital to to stay away from rivers and flooded tunnels. Schools and universities have been closed since Sunday. Saudi Arabia normally experiences such low rainfall that religious leaders often organise special prayers for rain. But in May last year, around 20 people were killed in flooding sparked by the kingdom’s heaviest rainfall in 25 years. Floods in the western city of Jeddah on the Red Sea coast killed 10 people in 2011 and 123 people in 2009. Poor drainage and uncontrolled construction were blamed for the high death tolls in Jeddah.